Margret Hartmann Robarge. Circled. With her father, mother and 10 siblings. Our grandfather George is standing, second from the right next to his mother Clara. 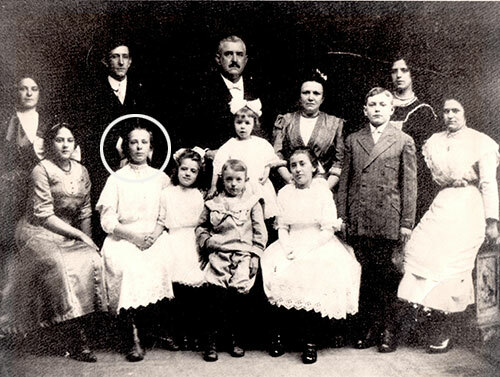 This is Margaret Hartmann Robage (circled in photo) memories of her childhood. Dictated to her daughter Leatrice in August and September 1966. Two years ago I found our very distant cousin Caleb from Canada. Caleb has spent a lot of hard work and time constructing this on-line family tree. I am very grateful for our cousin for this tree goes back centuries in time. On first click the Family Tree seems trivial but CLICK AROUND – you will be amazed at your absolutely incredible heritage! There is a row of links across the top. They say Index | Descendancy | Register | Pedigree etc. I would suggest clicking on these. -HARTMANN ONLINE FAMILY TREE- Click here to discover! Some notes from Caleb: “Any mistakes in the gedcom online can be fixed and updated later. I do not post info on living people on there to protect peoples identity. In my on and off extensive search for our heritage I have found out some very cool and very important information. Only because of our sister Barbs brave dig into our great aunts sisterhood on Menham NJ, (a letter mailed about 4 years ago) was I able to obtain the complete list of our Grandpa’s 12 brothers and sisters. With this information, I may have contact with someone who has access to even more information and even more exciting some photos of our great grandparents and their 12 children. 12. Alfred b:1906 m: 1933 d: unknown? 13. Marie Elizabeth b:1909 (never married) d: unknown ? #8 – George Joseph is our Grandfather . Also very new information is that he was married twice and his second wife – Alice Anderson our Grandmother, was the mother of our father George Charles. It is important to note here that in the 1950’s which was shortly after World War II and the holocaust, our Grandfather knocked off a ‘N’ on our last name. I remember our mother telling me it was a business decision based on the name Hartman (one ‘N’ Jewish) and Hartmann (2 ‘N’s’ being German). Since most salesmen in America in the 1950’s were Jewish, it was said that they merely avoided any contacts with German people. I am trying very hard to get in touch with the woman that posted this information on the web. Her Grandmother was our Grandfather’s sister; Clara Mathilde. I have emailed her twice so far with no return. Of corse I will never stop trying. Somewhere out there are photos of this family and I think she may have them. It would be amazing to look into the faces of a one-hundred year old family of fifteen and to see, perhaps, our own likeness’. You must understand that DNA and generation to generation chemistry is carried on and passed. We are what they were and although every individual that has ever visited this planet is entirely unique, but that families are in some spiritual and chemical way… are tied together for all eternity. Over the river and thru the woods…. a letter written in 1918, tells me where the Hartmann's lived! A letter received several years ago from Mendam NJ after an inquiry by our sister Barb about our two great aunts on our fathers side. Our grandfather came from a family of 12. Really, 13 but “he” died early in life. Health was a fragile thing in the beginning of the twentieth century. All you really need to do is walk through an old cemetery to see the short life spans and large number of young children. SO this first large family of Hartmanns in the United States of America lived in Jersey City. When I first saw that address, I knew that one day, I had to go there. SO here we go, over the river and thru the woods. I was pretty excited, almost like I felt as if the entire family of 15 was waiting for my arrival. In our great aunt Gertrude’s original letter she stated that she was born in NYC on June 6 1888. The first American Hartmann family had FIFTEEN children!! One sister and one brother died early so there were 13. Of these 13 I only know the name three of them. My grandfather George Joseph and his two sisters Gertrude and Frieda who both became nuns and therefore our sister Barb has attained their records by writing a letter to their home sisterhood. The church mentioned in Gertrud’s letter “Church of St Joseph Yorkville” at 408 East 87th Street still stands. It is there where I am going to attempt to get Baptismal records that may give me the remaining names, birthdates of the NINE girls and FOUR boys. 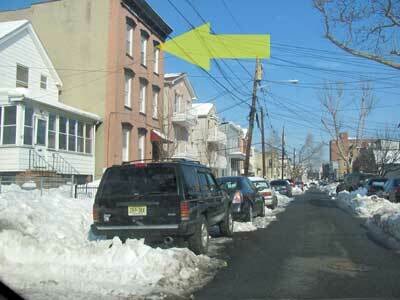 I might also be able to discover exactly when they moved to 15 Cambridge Ave in Jersey City, New Jersey. 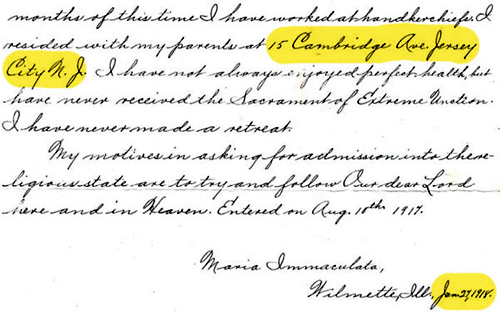 Gertrude also mentions that her father Charles was a printer…as am I! I don’t know the name of that bridge but I it got me into Jersey City. It was a weird day. I felt very alone and tired. Wishing someone was here with me on this journey. Before the bridge, passing the city of Newark. To me: a very depressing city with an even more depressing name. The only ties our family have there are that my aunt Carol and her husband Fred (Rebel) Dooley met there and married. Strange how a country boy from Alabama ended up as a parking lot attendant. I remember they owned a red VW punch-bug and me and my sister Barb rode in the back with the top down to go to their apartment that was on the top of a very large building there. This was one of the most remembered things of this journey. 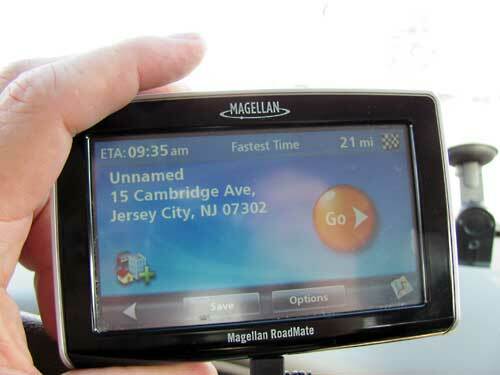 Waiting at the red light after the bridge…I’m in Jersey City. This beggar walks in between the cars with a paper cup. Looking for money. I gave him a handfull of change from my change jar that I keep in the car. He was very grateful. I watched in the rear view mirror behind me the dressed up fancy smancy couple, shake their heads, roll up their window and then roll their eyes. 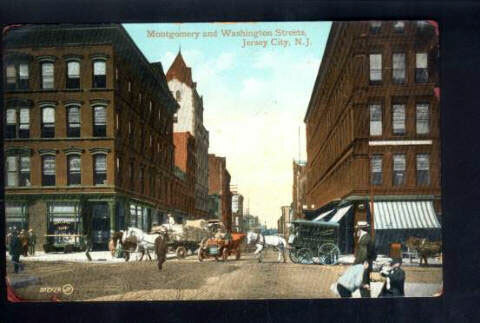 Old time Jersey City New Jersey. Turn of the century. No cars. No cell phones. Blue crisp sky day. Buried in time. “Rosy” my navigator was taking me through the streets of Jersey City 2011, where one hundred years earlier my great grandfather, mother and his kids played, shopped and worked. She took me down the very long main street, full of shops, cars and a melting pot of race, creed and color. Some things never change. I’m not quite sure what I was expecting but of corse I wasn’t expecting this. When I turned the corner onto Emerson Street…I was expecting everything to maybe turn black and white. I was looking for Charles R. Hartmann’s kids to be playing on the street. I was looking for a sepia sky, trolly cars, horse carriages. 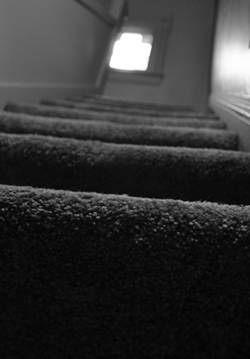 I was looking for maybe Clara Hartmann to be coming down the steps pregnant. These were the streets of my heritage. That in this space a family of 15 lived, struggled, had dinner together, celebrated holidays and never once thought that one century later the fathers son of one of their own would come here looking for them. Of corse I was disappointed. It was obviously not the same house, it was not the same street and certainly wasn’t the same city. Everything had changed. There were no survivors. 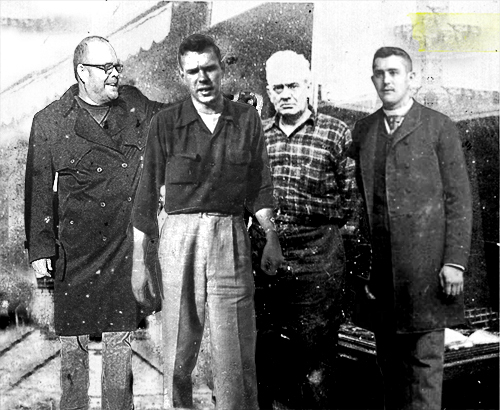 Nobody remembers “The Hartmann’s” … that big German family with the printer father. Everything was buried deeply in time. And in another hundred years, another hundred families will have been born and raised on these streets. That time and technology are interlocked into a giant machine that consumes the human spirit. All the laughter, tears, hopes and dreams of 15 Cambridge Street are gone. Not too long ago, they were the most important things in the world to the Hartmann’s. I just had to get out of the car and breath the air, walk the street, where once horse carriages trampled by. I looked around… and the wind blew some old newspapers down the street………. 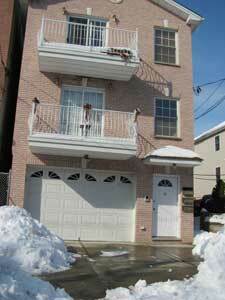 15 Cambridge, Jersey City, New Jersey.